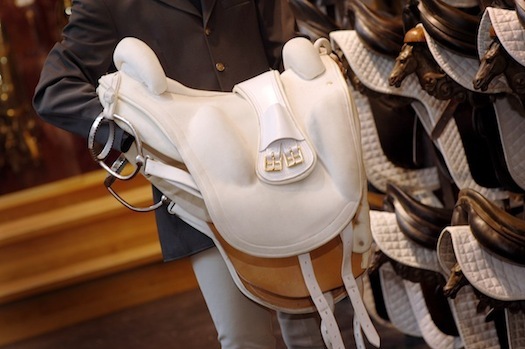 While Piaffe, Passage or Pirouette are common terms in classical dressage, we know at the latest when we hear words like Levade, Capriole or Courbette that we are talking about the Spanish Riding School & the High School of Equestrian Art. 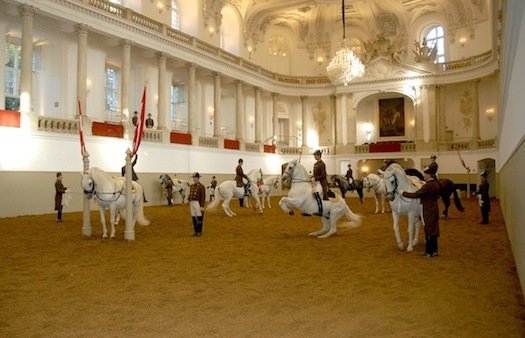 A short insight into the world of the beautiful Lipizzan horses and the Spanish Riding School in Vienna. 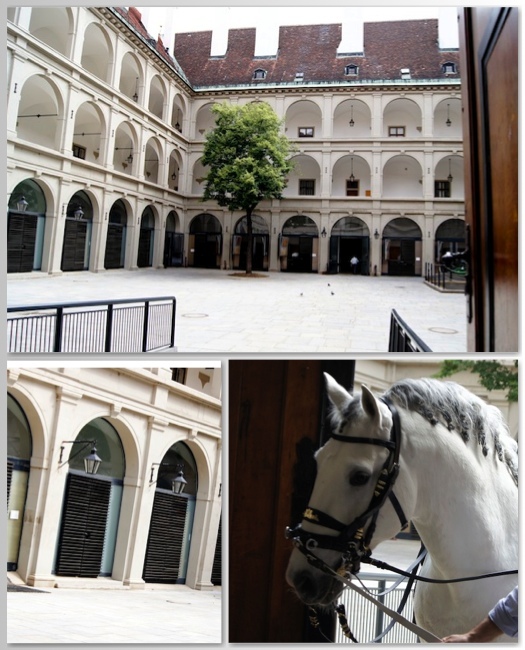 Most people are amazed when they walk through the arcades from Michaela to Joseph’s Square and see the beautiful stables of the Spanish Riding School. It almost looks unreal how the oldest cultural horse breed of Europe is presented here: The elegant Lipizzan horses are comfortable, completely relaxed chewing hay in their stables while watching the passing tourists. These are mostly busy taking pictures – inspired by the stables of the „Stallburg“ and its inhabitants with the positive charisma- and hoping to get closer to a Lipizzan horse. With some luck, it is possible to have a closer look at them: When the horses are brought to the Winter Riding School, they have to pass through the arcades and the visitors. Although it is located in the center of Vienna, this is a quiet and serene sight that could also be outside of the city : at the training center Heldenberg or the stud farm in Piber where the Lipizzaner pass the time during trainings or vacations. The „Stallburg“ is one of the most significant Renaissance buildings in Vienna. It was completely renovated in 2008: Among other things new stables were created with a view to the courtyard and simultaneously the entire yard was designed with a roof so that it can also be used for events. 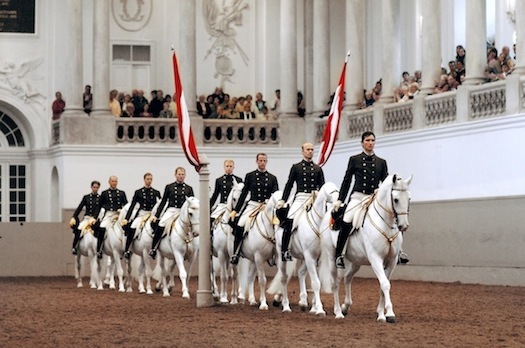 For example, one oft he best known events is the annual Fete Imperiale whichs benefits are used for the Lipizzan breed and the preservation of the Spanish Riding School. Beside the Stallburg the Winter Riding Hall, built 1735 by Josef Emanuel Fischer von Erlach (like the MusemsQuartier Vienna) , is more than worth a visit – it is said to be “the most beautiful riding hall in the world“. Here you can watch the Lipizzan horses and their Trainers while practicing the High School of equestrian art. During „morning work“ from Monday to Friday 10:00 to 12:00 you can watch the different Training stages oft he horses and how they are trained every day. 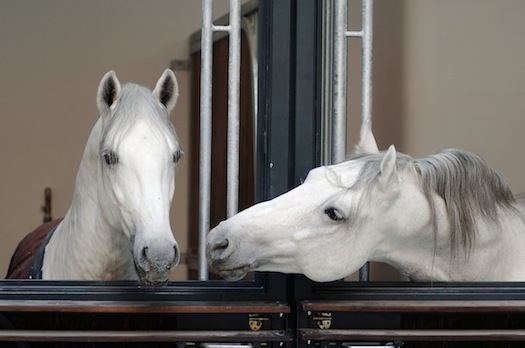 At the age of 4, the young stallions from the Spanish Riding School in Piber get to Vienna fort he first time. In their first year of training, they will become accustomed to the daily work and life of a riding horse . After about a year the stallions are passed to experienced Horse Trainers – the preparation for the High School starts. The horses are used to the curb, introduced to the assembly and to hand-work. 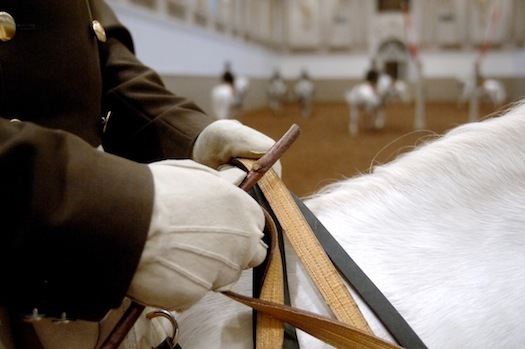 As the final phase of training – which is here taught to perfection – the Lipizzan horses learn Piaffe, Passage, Pirouettes, Caprioles, Levade and more. Once the training is completed the Lipizzan horse gets the white school saddle and the golden bridle – the formation is finished and it gets part of the performances in the Winter Riding School. You can visit one of the performances to different dates during the year – especially for those who are passionate about horse riding, the sight of the perfect harmony between horse and maker is unforgettable. At the performances you see Pas de deux, hand-work, long rein work and the “School Quadrille” who perform the „Airs above the ground“ like Levade, Courbette or Capriole. If you want to visit the Spanish Riding School you should get tickets to the show or morning work in time. A guided tour through the stables is also offered. 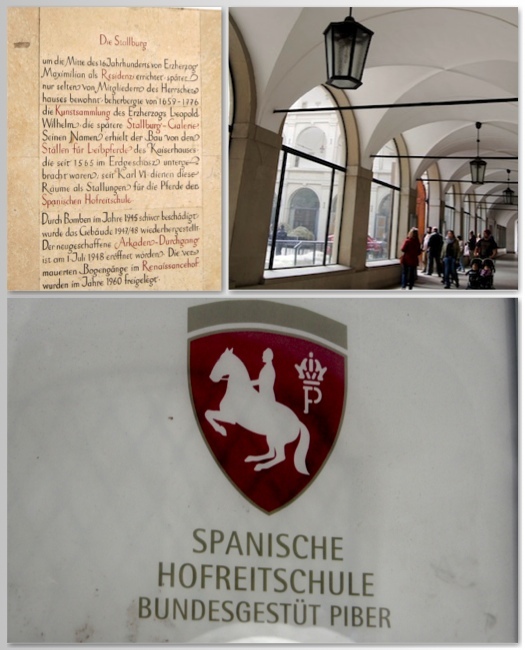 How to get to the Spanish Riding School from our Hotel? You can take a 15 Minutes walk through the City or you take Tram 43 to Schottentor and Bus 1A to Michaelerplatz .